I began playing Blood Bowl way back around 1996 or 1997. As a result, I have a lot of fond memories of most of the 3rd edition range of minis, and the Chaos Dwarf team in particular. I know the big hats put a lot of people off to the look of the team, but I LOVE them, and since those minis seem to be the most expensive 3rd edition minis on eBay, I would guess that I’m not the only one. In recent years, a number of independent mini companies have released their versions of the Chaos Dwarf team, and while almost all of them are very nice minis, none have really grabbed me. I don’t KNOW that it’s because none of the other independent teams have particularly big hats, but I don’t know that it isn’t either. I was very tempted by a couple of these teams, but never could seem to pull the trigger and buy any. 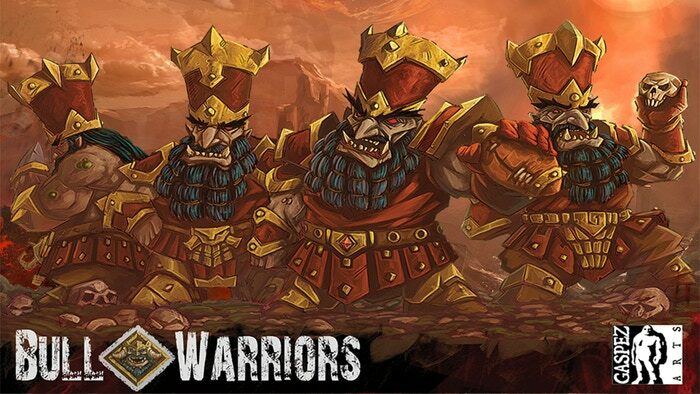 Then one day I logged in to Talk Fantasy Football and found a post from Gaspez-Arts promoting a crowdfunding campaign for a new Chaos Dwarf team, I was very pleasantly surprised when I viewed the preview images and saw some nice big hats on the heads of the Chaos Dwarf Blockers. This was a team I could get behind! They hearkened back to the classic look of the 3rd edition Chaos Dwarves, but also managed to not feel like a rip off copy of that team. I was intrigued. After following the campaign I reached out to Gaspez-Arts about their new team and they graciously agreed to send me a review copy. A few days ago, a package arrived at my door, and now it’s time to take my first look at this team in person. The container the team came in didn’t look particularly large, but they managed to pack a lot of minis into it. I couldn’t wait to start digging in to these minis. Gaspez-Arts accidentally forgot to send me bases for most of the minis, but they recognized their mistake before the package even arrived and emailed me to let me know that more bases are on their way. As a result, for this unboxing, I chose to use the current Games Workshop 32 mm Blood Bowl bases. First up we have a group shot of the Chaos Dwarf Blockers. All but one of these minis are single piece minis, and they still managed to have fairly dynamic poses for Blockers, which is very nice. You might notice that I didn’t attach the arm on the mini on the far right, which is something I usually do for unboxings. I actually didn’t assemble any of the multi-part minis on this team, and I’ll explain why later. Let’s take a closer look at the individual minis. As you can see, the team comes with six different uniquely sculpted Blockers. The poses are very well sculpted and they look to have used a high quality caster as the details on the minis are very nice and sharp. Flash from the casting process is always present on metal minis, but is fairly minimal on these and should be easily manageable. So far, so good! Along with the Chaos Dwarf Blockers, we get seven Hobgoblins with the team. Like the Dwarves, the Hobgoblins are mostly single piece minis, and they have nice sculpts with crisp details. Interestingly, Hobgoblins seem to be the hardest part of a Chaos Dwarf team to get right. The 3rd edition Hobgoblins still have my favorite Hobgoblin look, but I can honestly say that the Gaspez-Arts Hobgoblins are my favorite independent Hobgoblins by far. Now it’s time for the real rock stars of the Chaos Dwarf team… The Bull Centaurs! The first thing that struck me with these guys is their size… they’re BIG. Not insanely so, but you’ll definitely need to use Prone and Stun counters for these guys when they get knocked down. As with the other minis, the sculpts are really nice, and the casting is very clean. The animal bodies of the Bull Centaurs are heavily muscled and give a real sense of power. The last of the player minis is the Minotaur. As you can see, the Minotaur is mostly resin, though the tail and horns are metal. It seems a little strange, but I’m sure Gaspez-Arts had a good reason for that choice. There is an option for the Minotaur’s right arm to use a normal hand, or a Claw mutation, as well as a tail option with a Claw sculpted in. The resin used for the Minotaur appears to be good quality, and like all the other minis, the cast itself is nice and crisp. There are even a couple of sideline minis included in the form of a coach and an apothecary. 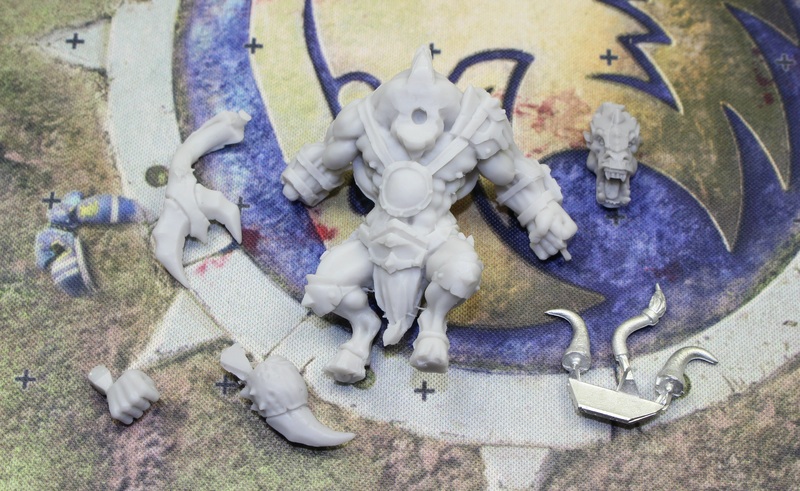 Both minis are Resin like the Minotaur, with the coach also coming with right hand options (one pointing, one with an extended middle finger… my favorite!). Sculpting and casting are on par with the rest of the team. The final items included in the box are a set of counters. The set includes three standard re-roll counters, one Leader re-roll counter, one Bull Warriors Turn/Score counter, and one Prone/Stunned counter. 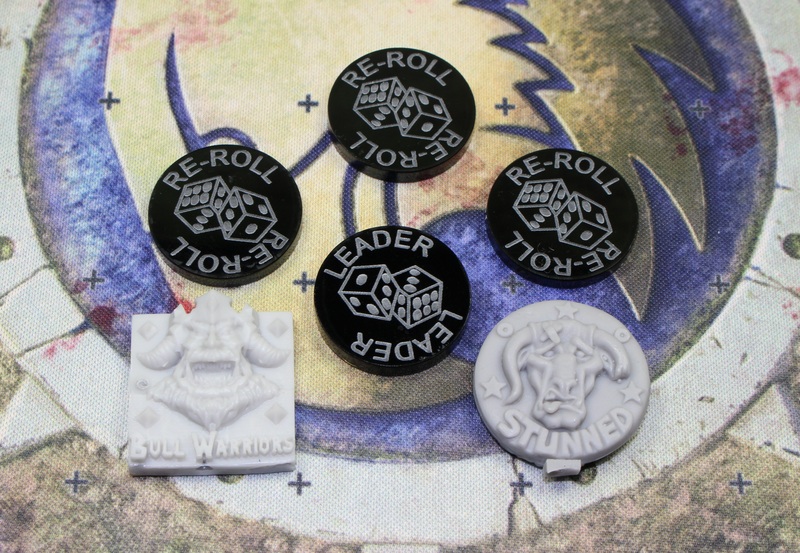 The re-roll counters are simple etched plastic discs, while the other two are sculpted resin pieces. Finally, as always let’s take a look at a few size comparison shots of the minis. As you would probably expect, the minis of Gaspez-Arts Chaos Dwarf team are quite a bit larger than their 3rd edition counterparts. Probably the biggest jump in size is the bulkiness of the bodies on the Bull Centaurs. As you can see from the pictures, the Gaspez-Arts Bull Centaur bodies far more muscled and thick than the 3rd edition Hthark the Unstoppable. In fact, the torso of the Gaspez-Arts mini doesn’t even start until right about nose height on Hthark. The size difference is pretty noticeable on the other minis as well. The top rim of a 3rd edition hat (minus the spike) is just shoulder high on the new minis. The Chaos Dwarf Blockers are only slightly shorter than the new Games Workshop Human Linemen without counting the hats, and slightly taller with the hats. The Minotaur is also slightly larger than the new Forge World Minotaur. I think that the size will be OK when playing against other newer 32 mm scale minis, but scale differences might get a little on the silly side if you’re playing against someone using 3rd, or worse, 2nd edition minis. However, as time goes on, and Games Workshop (and other companies) make and sell more 32 mm scale minis, I think differences from the old 28 mm scale will become less important to people. Once, a 32 mm Blood Bowl team seemed to be sacrilege to many players, but now, it’s the new norm. That just about wraps up my unboxing and review of this team. I think it’s a great modern take on a 3rd edition inspired Chaos Dwarf team. There are actually several other minis and extras available for purchase for this team beyond what I have shown here, so be sure to check out the Gaspez-Arts website for all of the available minis for this team. They are also currently running a Kickstarter campaign for another new team, which is definitely worth checking out. I’ll try to write up a post on the current crowdfunding campaigns in a few days and go into a little more detail on them. Since I did not fully assemble the minis, I thought I would share a few pics of the painted team from Gaspez-Arts to show what these minis can really look like. And finally… the reason that I did not fully assemble the minis on this team is simple. I want to give this team away to one of our readers! I’m going to hold a drawing at the end of March, and the winner of the drawing will get this team. All you need to do to enter is comment below, or comment on the accompanying post about this unboxing on the Wyrd Stones and Tackle Zones Facebook page. Good luck! This entry was posted in Blood Bowl, Gaming, New Releases and tagged Blood Bowl, Bull Warriors, Chaos Dwarf team, Chaos Dwarves, Fantasy Football, gaming, Gaspez-Arts, Hthark the Unstoppable, Miniatures, table-top games, tabletop wargames, Talk Fantasy Football, wargames, Wargaming by Mike C. Bookmark the permalink. Thanks for this unboxing – I’ve backed Gaspez’s new campaign for a Kislev team so it is great to here about the quality of the models. With regards to the Bull Warriors, the kickstarter included hat and hatless versions….both look great but there is something about the hats that is just right. The Kislev team does look great, too. Team looks great. I talked myself of getting the 3rd edition recasts and regret it enormously now! I love the red and yellow for CD, unusual but right on! Yeah, that color scheme really works! Very nice review. I’m really curious at how the pewter models are too paint compared to the resin ones. Thank you for the unboxing, it’s a beautiful team. A lovely write-up Mike! I have been eyeing these guys up for a while, they were already my favourite of the cdorf options available, and your description just reinforces that. Thanks! It’s nice to be back at it. Really like this team, especially the minotaur. There are few great Chaos Dwarves teams on the market and once again, Gaspez-Arts did welle with this one. Keep on going with the blog, you’re doing a great job ! Welcome back, Mikey! I unfortunately dropped out from getting this team during the Kickstarter. I’m holding on tight with the new Kislev team, and will probably pick up the Chaos Dwarves later on. Your review of them is great. Since you have both metal and resin minis in hand, would you pick one over the other if you were to pick up a future team from Gaspez-Arts? The metal looks pretty sharp, but the resin looks really nice as well. Well, I used to be all about metal minis only, but these days… I don’t know. Both have their merits. I think I would probably go with which ever was cheaper, honestly. The quality of both seems pretty much identical these days. Surprisingly, they were the same price (metal or resin) on both Kickstarters. If the quality is the same, then it’s just a matter of material preference. I do like the weight of metal minis over plastic and find some resins a pain to prep. So I guess I would lean a little more towards metal overall. so just by saying this I’m entered into the draw? Glad your back, I do enjoy your articles. Great unboxing review! You’ve turned me into a big hat convert! These minis look really cool and the hats seem to make the Chaos Dwarf team. I’m sorry I missed out on that Kickstarter. Thanks for giving us Blood Bowl fans something to wish for. I agree that the hobgoblins come close but they still don’t have that appeal of the 3rd edition models. I don’t think I’ll ever sell my 3rd edition team but I see myself using this gaspez team in future tournaments. out of interest was there a lucky winner of this team? Yes, one of our Facebook followers won. Sorry for not making an official announcement.